#GivingTuesday2018 is fast approaching. In fact, we are just a little over a month until the big day. By now you probably have your campaign in motion and it’s gaining speed. #GivingTuesday is a social movement that fundraises for causes and encourages volunteering. Any activity that gives back to the community and world at large is generally acceptable. Despite having your plan set in motion, there is still one valuable resource you can add to your #GivingTuesday 2018 plan: GivingBands. GivingBands were created with giving in mind. There are plenty of uses for GivingBands, but #GivingTuesday incentives may be one of the best. GivingBands serve as a reminder of your cause not to mention are a fashionable billboard. In other words, GivingBands are a wearable way to spread your message and increase awareness. In fact, people typically support causes that are near and dear to the hearts of people they trust. This means they are more likely to donate or volunteer for causes their family and friends support. This is what makes having a tangible, branded product a valuable asset. When it comes to donations, products can increase the likelihood of receiving support. There are many ways to accomplish this. One of the trendier ways is levels of giving. For example, when you give $15 you receive a GivingBand in return. There is an incentive to give a specific amount in order to receive something in return. Another option is simply to acknolwedge donations of all kinds no matter the amount. Donations and fundraising can be challenging so offering a fun, engaging way to channel support never hurts. On the other hand, GivingBands are a wonderful way to thank your volunteers on #GivingTuesday. Not only are you showing gratitude to those who have given their time to help, but you’re giving them a token of your generosity. GivingBands build your community and unite people with one common bond. They are vehicle throughout your organization to show unity. Given everything we have said, it’s still not too late to get your GivingBands. GivingBands are an integral part of your marketing and your campaign. This is why we have come up with a GivingBands for #GivingTuesday matching gift package. 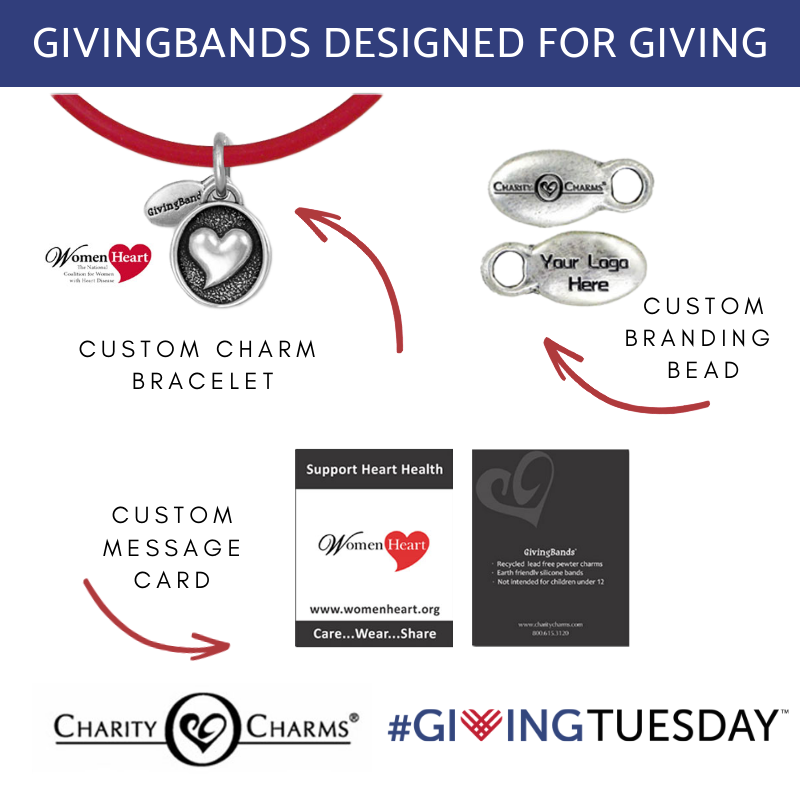 This package includes GivingBands, a custom charm made from your logo, and message cards. Everything you need to enhance your #GivingTuesday campaign. We are in the home stretch so this is your last chance to order GivingBands for #GivingTuesday 2018.